Self Contained Accommodation- Our cottages are located on a 250 acre farming property just three hours drive south of Perth. Explore our picturesque bushland property and experience the natural beauty all year round. Quiet enough to hear the birds sing, dark enough to see the stars. Relax by the fireplace with a local bottle of wine or journey out to enjoy all the South West has to offer- wineries, breweries, galleries, beaches, bush walks, the list goes on. Wyadup Brook Cottages have been craftsmen built and feature pine logs rendered brick and exposed jarrah. This combination of elements complements the natural setting of our unique cottages. We opened on 26th December 1996 and have enjoyed our years of operation. We have six fully self-contained cottages nestled under the peppermint trees near the Wyadup Brook which runs through the middle of our 250 acre beef cattle farm. Four cottages have two bedrooms, a queen size bed in one bedroom and 3 single beds in the second bedroom, or a double bed and a single bed in the second bedroom. We can provide extra single beds which can be set up in the large living area if required. So, each two bedroom cottage comfortably sleeps five to six people. We now also have a fully self contained one bedroom cottage great for singles, couples or small families. This cottage has a queen bed and a single bed in the bedroom and a spare single bed in the living area. Our sixth cottage is a double storey 3 bedroom cottage completed in 2001. This cottage has a queen bed downstairs, a queen bed upstairs and in the third bedroom upstairs is a double bed and 3 single beds. Will sleep up to 8 or 9 people so is great for larger groups and family gatherings. Beautiful, relaxing bush setting. Comfortable cabins with great beds. Close to lots of Margaret River attractions while very reasonably priced. We just keep going back. Accommodation is exactly as advertised with a great location that is convenient to the beach and shopping whilst still maintaining its rural feel. The price point is is spot on. Customer service is excellent. It’s best to book via their website as opposed to booking sites for best price. Six kilometres south of the Yallingup Post Office along Caves Road, turn right into Wyadup Road. 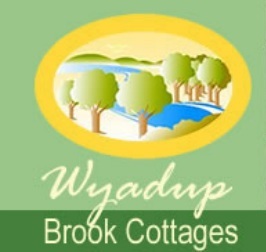 Travel 300 metres west along Wyadup Road and turn left into Wyadup Brook Cottages.